I’d heard about the fish at Green Corner at least eight months ago and have been meaning to go back ever since. The sad thing is that I’d heard about it while sitting at Green Corner eight months ago trying to order the fish… which they didn’t have any of. 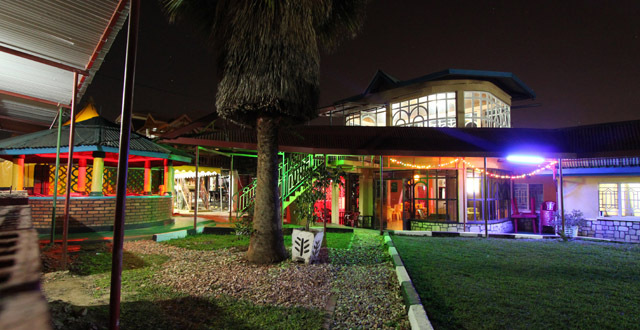 We ended up heading off to some other Nyamirambo restaurant (that I doubt I’d ever be able to find again) for fish and were really impressed so so Green Corner was temporarily forgotten. Last night finally saw me get back there and this time they had fish. It took almost two hours to appear, but when it came, it was worth the wait. 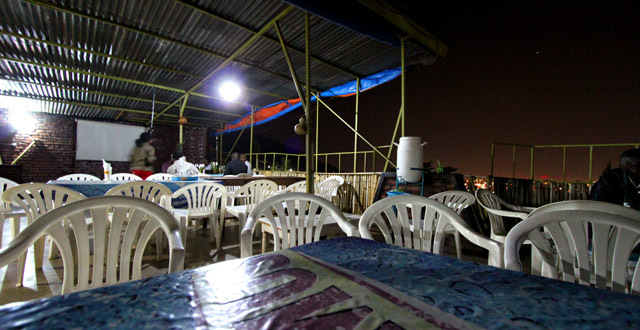 One friend who’s been in Kigali for awhile claimed it to be the best fish he’s had in town. There were mentions of food orgasms and the eight of us pretty much ripped into the fish without mercy with our bare hands. 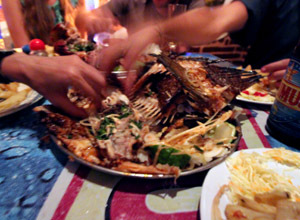 That’s how it’s done… they serve up a giant fish, onions and a few limes and you go all caveman on it for as long as it takes to rip the flesh from its bones. It’s nice. The one area where this place lets you down is the service. The food took almost two hours to come out, they forgot our brochettes altogether, they gave us an extra plate of chips that we didn’t order, the bill was wrong (due to the missing brochettes), and they inexplicably only allowed on person to wash their hands before whisking the bucket away. That was more funny than annoying though as the rest of us sat there with nasty fish hands for awhile. But really you’re here for the fish, not the service. It’s so good that a few forgotten orders, miscalculations and the fact that it took an eternity didn’t really phase us by the time everything was said and done. 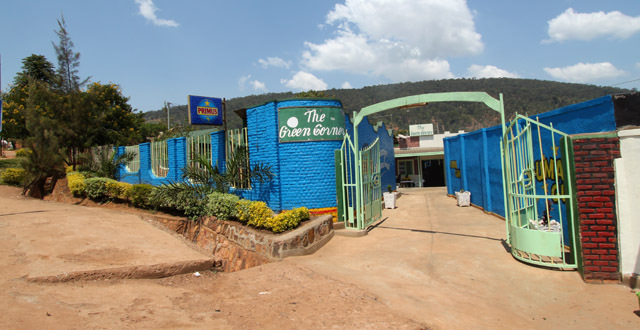 Green Corner is located deep into Nyamirambo down the main road and then turn right down another main road (I think the road that doubles back to Nyamigogo). 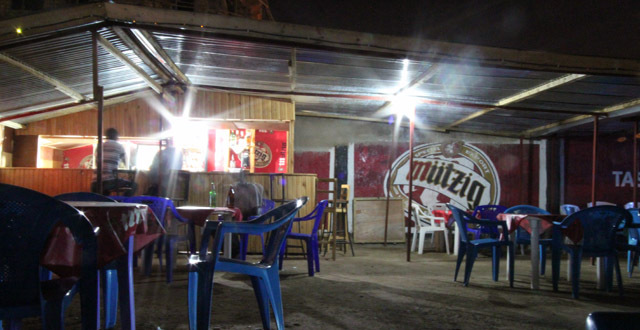 Moto drivers in Nyamirambo should know where it is so just get yourself there and then stop to ask directions and you should be ok.
It’s a fun night out with great food in a nice setting. Getting to Nyamirambo might be a trek for people living on the other side of town, but it’s something different and the fish makes the journey worth it. This was one of the best fish meals I’ve ever had! Highly recommended. Great writeup! To confirm – this place is f-ing epic. Last time I went they didn’t have any fish. The horror! But fortunately they had chickens. Whole chickens that were sort of flattened and cooked in a spicy way. It wasn’t as chewy as most chicken you get in local places and I’d recommend giving it a try! Their goat brochettes were really good, as well. But a word of advice… if you have your heart set on fish, make sure they’ll have it before you make the trip there. do you happen to have a number for green corner so we can call ahead about the fish? Chrissy I did have the number until my phone got stolen at Papyrus. Now it’s gone. I think I miss the phone number more than I miss the phone! Next time I head out there I’ll grab it. Or if anyone else goes and wants to share it here, please do! Great fish and atmosphere . 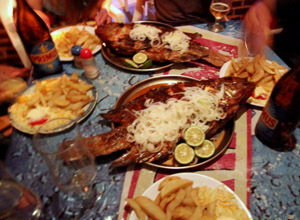 I concur the best fish in Kigali. We just phone to book a table and give our order about two hours before going… Pity about the toilets which one sometimes has to use. But on the whole- a great night out. as for the smell of fishy hands… use the lemon provided for the fish. Helps a bit though.